BuyEssayOnline.org is a new writing service, we believe. At least, we have been unable to find any online mention of the company beyond that past year. We have been asked to conduct an evaluation of this writing service by a student who had a poor experience. To provide an accurate and objective BuyEssayOnline review, we looked at a number of factors – the information that the website provides regarding its products and services, the policies, Buy Essay Online testimonials, quality of writing samples and/or blog posts on the site, pricing, discounts, and BuyEssayOnline customer reviews that we have found on the web. As well, we ordered a research paper and held conversations with both the customer support department and our writer. This is a summary of our findings. Buy Essay Online offers both academic and business writing products and services. In the area of academic products and services, students from high school forward can order virtually any type of product, from a book review or essay through a Ph.D. dissertation. Admissions and scholarship essays are also offered. Other services include editing and proofreading. Business writing is also wide-ranging, from plans and proposals, to copywriting, to marketing materials and reports. Editing and proofreading is also available. Our ultimate Buy Essay Online rating results from several factors involved in evaluating the quality of products. And that quality speaks to the quality of the writers the service is using. First, the site content. The homepage has a lengthy amount of text explain the benefits of the company. Unfortunately, there are numerous punctuation and word usage errors, leading us to believe that the claim of using only U.S. and UK writers may not in fact be fully true. Of any type of web content, that which is written for a writing service should be impeccable. This is not. Next, the comments and feedback from customers. The comments we were able to find on other review sites, along with social media, are definitely mixed. Customers report receiving their products on time; however, there were concerns expressed about help from the customer support department and the ultimate writing quality of the final drafts they received. The research paper we received was not of the quality we would expect for a university-level work. Again, there were word usage, punctuation, and basic grammar errors that no ENL writer should have missed. We had to point these out to our writer when we asked for revisions. The blog demonstrated the same writing quality issues. There was lack of structure, no thesis statements, and a number of grammatical and mechanical mistakes. Other concerns include the fact that there are no published policies on this company website, there is no evidence of a BuyEssayOnline BBB membership and very little specific information about the writers. Customer support is provided by an answering service, and ESL individuals who are hard to understand. One rep told us we could have a complete dissertation within 5 days – ridiculous. BuyEssayOnline.com prices are high for the industry average. Our 8-page paper was priced at $227.40. There is a pricing chart which covers academic writing, editing and proofreading, and business writing separately. Payments are fully secure and are by all major, basic methods. We can state that BuyEssayOnline is not a scam. We paid our money and did receive a product on time. This was very confusing. The homepage listed three types of BuyEssayOnline discounts – lifetime, seasonal, and “help-a-friend.” It also stated that there were BuyEssayOnline coupons codes for these. 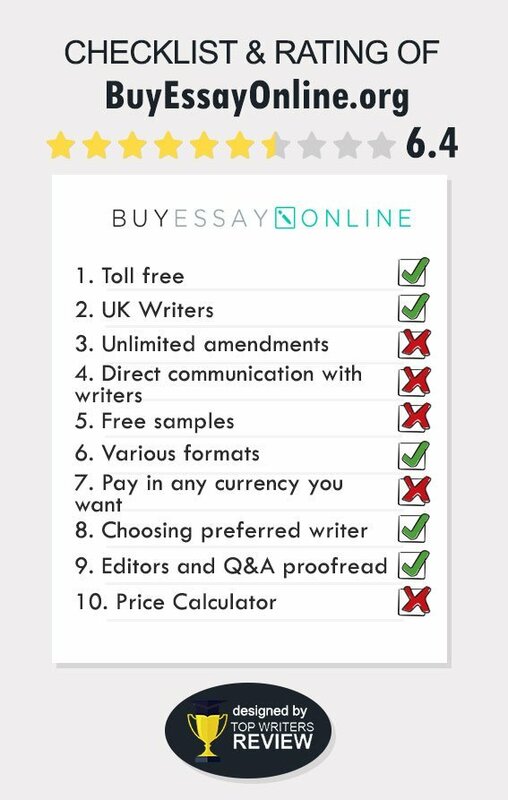 On the order form was a field for a Buy Essay Online promo code. Yet, these discount amounts and codes were nowhere to be found. Customer support did tell us we had to request them, and then would be told if we qualified for them. They could not provide any further detail. We asked for a discount for our research paper order and were told it did not qualify because it was too short. We have no idea what “refer-a-friend” is. The only extra we could find was free revisions, and we did get those. In assessing BuyEssayOnline.com pros & cons, we can say that the company is legitimate, but also that it is obviously new. Without written and published policies, it is difficult to develop trust. As well, we suspect that at least some of the writers are ESL, given the quality level of products Overall, we are assigning a rating of “Fair” to this service. They are hiring the cream of the writing industry.. Well, if that's true, then we're watching the decline of the writing industry and shouldn't expect for anything god to be published soon I guess. Because what they sent to me is so bad. I needed an essay when I was applying for a scholarship at college. Unfortunately, I didn`t have enough time to write it myself so ordered one from these guys. It was well-written and structured. But it wasn`t creative enough to bring me a scholarship I hoped for. And their price are a bit too high. The buyessayonline wasn`t the worst thing in my academic life. I kinda wanna thank them for their tries to help with the research proposal I had. The chapter of introduction seemed advanced and full of proves, not just on promises, but written in words. This looks like a nice company. Ordered editing for my project since it is to be published and I'm nervous. The supports are friendly. I'll leave another comment as soon as receive the completed paper. Nicely written CV. Even though their main thing are essays, they do some nice stuff for business people too!